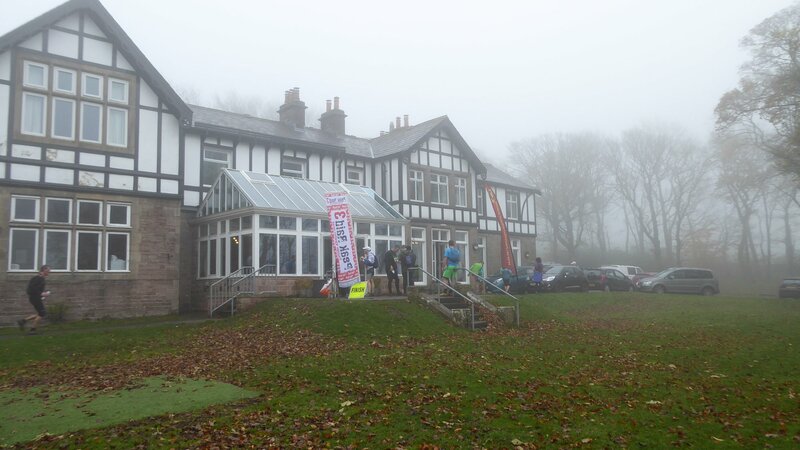 Peak Raid Mini Mountain Marathon is a series of 4 mountain orienteering events held in the Peak District from September to December each year. The premise is simple. You have 3 hours to find as many ‘controls’ (checkpoints) as you can and get back to the start. For every minute over 3 hours you start losing the points you collected, and fast! Round 2 was in the new area of the Goyt Valley. I entered as a mixed pair with my partner. We have done a few of these events so knew what to expect. Usually rough ground and low cloud. Driving over to Buxton in the morning, the fog had settled down low and wasn’t budging. We knew it would be a good day to test the navigation skills. The first task was to find the start with the little map they give you. That’s the most nerve-wracking part and is not the point in the day where you want to go wrong. After making it to the start though, the real navigation begins. We dibbed in to start the clock, and picked up our maps. It was 8:50 am, so we knew we had to be back by 11:50. The map had 15 control points, each with differing points depending on their perceived difficulty to get to or find. We agreed on a rough route and set off. Within two minutes my partner slipped on a very slippy bridge and hit her head. We thought that was game over, but a few minutes sitting down, everything seemed OK and we properly got on the way. The cloud made navigation tricky, but the course was very quick. Lots of runnable paths and tracks and nice navigation features. I knew the legs were going to get tired. We ticked off the first 5 controls we planned to visit whilst crossing the Peak trail Autumn Series race route a number of times. There were some concerned looks due to all these navigation event runners heading off in all directions. After the first few it was a climb up to the view point of Shining tour. Granted there was no view at all with around 20 metres visibility. At this point we were doing well for time and decided to go for a couple of extra ones we had left for the way back in case we were early. I knew we were racking up a good score at this point. On the way back we had to cross a busy road, where they gave 1 minute rest which was well needed. We had just 8 minutes to make it back to the finish with a hill climb in the way. We put our last bit of effort getting back to the finish, dibbing in with 2 minutes to spare…phew! To our delight we found ourselves (temporarily) at the top of the mixed category leaderboard with 392 points out of 502, the best we had done at a peak raid. By the end of the day we were in 4th/19 in the mixed pairs and 30th overall out of 171. These are fantastic navigation events for both the experienced, and the total beginners. You can take it at your own pace and do as much or as little as you want. And you can also run in pairs. I couldn’t recommend it highly enough for the friendly atmosphere and relaxed vibe. Give them a go and you won’t regret it. It’s just like a treasure hunt, but often with bad weather and no prizes! The winning male was Adam Fieldhouse of Lancaster University Orienteering Club, getting the full 502 points in 2:41:45.